I must be forgiven for some of my nutritional (and editorial) idiosyncrasies...after all, I share my thoughts and passions in genuine attempt to inspire others to eat well. So it is with that humble admission that I must again turn our conversation to beans. Sweet, glorious legumes in all their shapes, sizes and colours. The fibre! The protein! The magnesium! Not a seminar goes by without my singing the praises of the musical fruit...and I can barely go 3 weeks on EDBH without sliding in a plug for the noble bean. And now I have found allies in my quest to encourage the world to eat more beans; they have even written a cookbook to entice you to do so. 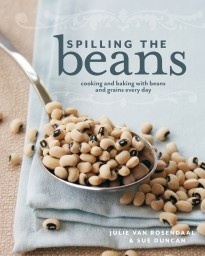 Julie van Rosendaal and Sue Duncan, two Canadians with a love for the humble legume, published their book, Spilling the Beans, just this year and thanks to my mom...their book ended up in my kitchen. What I admire about this book is that it is a love affair with beans and all of the comforting, hearty meals that they inspire. This is not a vegetarian book, although many recipes are vegetarian. It is also not a "health food" book, although many recipes are incredibly healthy. This is a book to appeal to everyone, from the bacon lover to the sweet tooth. It will convert you to our bean mission. I promise. The authors offer some compelling reasons for eating more beans in the book's brief introduction: that beans are planet friendly, economical and, of course, incredibly healthy. And they have found a way to get beans into almost every type of food imaginable: from cinnamon buns to muffins and mac and cheese to scones, there is a bean recipe for every appetite. The photography, from Julie herself, hits just the right foodie note and the book is beautiful. So far, I have tried 3 recipes and all of them have been a smashing success: the black-eyed pea and kale soup with cheesy croutons; the chard, white bean and sweet potato gratin which my 15 month old could not get enough of and the black bean brownies. You heard me, brownies. I am sharing the gratin recipe here as I have made it 6 times since owning the book. It has gotten in the way of my trying other recipes, just like when you can't stop ordering the same dish every time you go out to a certain restaurant. Excerpted from Spilling the Beans (Whitecap Books) by Julie van Rosendaal and Sue Duncan and used with permission. Heat a drizzle of oil in a heavy skillet set over medium-high heat and cook the onion for a few minutes. Add the chard, sprinkle with salt and cook until the chard wilts and there is no moisture left in the pan. Transfer to a bowl. Add the butter and flour to the skillet and whisk together to make a paste. Whisk in the milk, then add the garlic and bring to a simmer. Boil for 2 minutes, whisking; season with salt and pepper and remove from the heat. Preheat the oven to 400 degrees. Spray a baking dish with nonstick cooking spray. Spread half of the sweet potatoes in the baking dish. Top with half the beans, a sprinkle of nutmeg, salt and pepper, half of the greens mixture, half of the cheese and half of the sauce. Layer the rest of the potatoes, beans, greens and sauce and top with the rest of the cheese. Cover with tin foil and bake for about 45 minutes, then take the tin foil off and bake for another 15 minutes, until golden and bubbly. Let stand for 15 minutes before serving. Bless the mighty bean!!! I keep thinking I should incorporate them into our meals more, they are such nutritional powerhouses. Thanks for the reminder!! !